Set in one of the most tumultuous years in the second half of the 20th century, Tim Wendel’s Summer of ’68 is not only the story about the 1968 Major League Baseball season, but also a meticulous history lesson outlining the dawning of a new age in baseball—and in American history. The story of the 1968 Major League Baseball season featuring two dynamic teams in the St. Louis Cardinals and Detroit Tigers serves as the perfect mirror in which to look back more than 40 years when the face of America was changing before our very eyes. The cultural mores from centuries of apathy were being shaken to the core. The teams and players in 1968 were stuck in the middle of a cultural war in which baseball, its teams, and players served as catalysts for change regarding civil rights—not to mention a distraction from some of the most heinous and inexcusable acts of repression and degradation not seen since the Civil War. 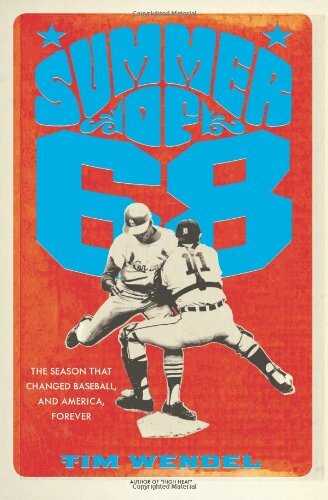 Skillfully, author Wendel leads readers on this history lesson from spring training to the World Series of 1968 by interspersing the stories of players like St. Louis Cardinals fireballer Bob Gibson and Detroit Tigers slugger Willie Horton as they both tried to navigate an American society filled with hatred and racism. Ultimately, amid all the tumult of 1968—the assassinations of Dr. Martin Luther King, Jr. and Senator Robert F. Kennedy, the 1968 Democratic National Convention, riots, Vietnam and overall uneasiness that was pervasive in America’s cities—the author brings his readers back to baseball. Baseball is the thread that holds the fabric of America together, and there was no better example than 1968. The author doesn’t prosthelytize or try to insult the reader by glorifying the game and its characters in 1968. Mr. Wendel engagingly presents the facts of what was a game-changing year in American history for baseball, but most importantly for the citizens of America who could see there was a wrong to right—and it was up to us to achieve that change.